I would like to take this opportunity to again thank you for your support and membership in the Friends of NCBDDD and update you on our current activities. As you know, the Friends publish a monthly newsletter, host an active list serve, maintain the Friends of NCBDDD website and sponsor webinars. To add to our activities, and for use by you in your community, with colleagues and partners, the Friends of NCBDDD has developed four (4) one pagers on “NCBDDD and Public Health,” “The Public Health Impact of NCBDDD Disability Programs,” “The Public Health Impact of NCBDDDD Birth Defects Program” and “The Public Health Impact of NCBDDD Blood Disorders Programs.” The documents will soon be available on the Friends website and for your use. I would like to make all the Friends of NCBDDD aware of another opportunity for you as a member of the Friends of NCBDDDD. As a member of the Friends of NCBDDD, you may join and play an active role in the Friends of NCBDDD Advocacy Coalition. In 2011, the Friends of NCBDDD Advocacy Coalition was created to advocate for NCBDDD funding and structure. The Friends of NCBDDD Advocacy Coalition is open to any member of the Friends of NCBDDD and is chaired by three volunteer co-chairs – Clarke Ross (disability), Emil Wigode (birth defects) and Randy Fenninger (blood disorders). The Advocacy Coalition was developed in order to keep the roles and responsibilities distinct between the education and awareness mission of the Friends of NCBDDD and the advocacy role of the Friends of NCBDDD Advocacy Coalition. The Friends of NCBDDD Advocacy Coalition has its own Administrative Guidelines. The advocacy coalition is not a list serve. It is a group of largely DC based people who actively advocate a strong NCBDDD appropriations base. If you are interested in joining or learning more about the Advocacy Coalition, please contact Clarke Ross at clarkeross10@comcast.net. The Friends of NCBDDD is putting together an Exploratory Committee to assess the feasibility of hosting an on-site Friends of NCBDDD meeting in 2012 and will keep you updated on our progress. Thank you again for your membership in the Friends of NCBDDD, and I look forward to serving as your Chair and working together in 2012. As always, please contact me with any questions, concerns or ideas at rcarlin@aahd.us and visit the Friends of NCBDDD website at www.friendsofncbddd.org for updates. The Centers for Disease Control and Prevention (CDC) introduces Disability and Health Data System (DHDS). Disability and Health Data System is an online interactive system that helps quickly translate state-level, disability-specific data into information that can be used by state health departments, national disability and health organizations, policymakers, researchers, educators, and others. Discover the variety of ways you can use Disability and Health Data System in your state. From identifying population needs and guiding research, to informing decisions and generating ideas, Disability Health and Data System will provide you with a more significant understanding of the public health picture in your area and across the United States. Click here to register! 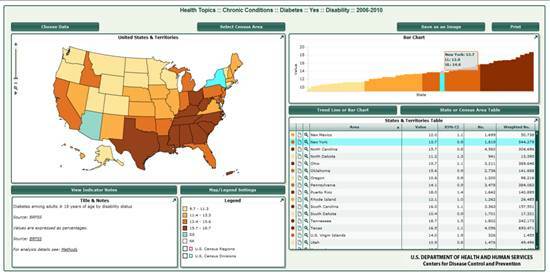 Learn the ins and outs of Disability and Health Data System with a tutorial. We will show you how to find and view data, use the interactive maps, bar charts, trend lines and tables, and customize the layout for your best experience. After this webinar, you’ll know how to quickly find what you need – and find what you didn’t know you needed. Both webinars will be recorded and made available on AUCD’s Webinar Library. Please add an additional sentence on how to follow up with the advocacy coalition. For further information, please contact Clarke Ross at clarkeross10@comcast.net. To view the Review of FY 2013 Budget Request webinar, click here. The American Journal of Preventive Medicine recently published a special supplement that focused on Blood Disorders in Public Health. Experts in the latest AJPM supplement say, “Public health should focus not only on reducing the burden of common diseases but also address the needs of people with blood disorders, even those considered relatively uncommon in the US and western Europe.” The supplement, made up of 13 research papers and five workshop/meeting summaries, is authored by top medical educators and public health professionals. Its publication was supported by the CDC through a cooperative agreement with the Association for Prevention Teaching and Research. In partnership with the CDC’s National Center on Birth Defects and Developmental Disabilities (NCBDDD), NACCHO selected Cleveland County Health Department, Coconino County Public Health Services District, Public Health-Dayton and Montgomery County, and Schenectady County Public Health Services to create video media projects highlighting their agencies’ successes in preventing birth defects and developmental disabilities. This project was conducted as a part of NCBDDD’s 10 Years of Service activities and to demonstrate how CDC’s research and science help advance positive health outcomes at the local level. BlazeSports America was one of ten national organizations funded in 2010 by the U.S. Department of Health and Human Services’ Communities Putting Prevention to Work (CPPW) initiative and the only such organization to focus solely on people with disabilities. BlazeSports is participating in CPPW by helping communities implement solid prevention policies that will enable residents to live longer, healthier lives. Over the last year and a half, BlazeSports has trained more than 350 professionals from 33 states on policy implementation strategies to address barriers and increase access to physical activity for people with disabilities. BlazeSports has also directly supported the policy and environmental change efforts of five communities. Among the many successes in this project has been the development of a resolution which has been adopted in five counties in West Virginia in support of daily physical education and school wellness policies that BlazeSports modified to be more inclusive of students with disabilities; the resolution is now under consideration in twelve Maine schools. BlazeSports has also disseminated inclusive physical activity resources to over 2,000 professionals and agencies during this time and is currently distributing the 2nd Edition of the BlazeSports Active for Life Guide. Dr. Robert Brent, MD, PhD, is a Distinguished Professor of Pediatrics, Radiology, and Pathology, at the A.I. DuPont Hospital for Children, Thomas Jefferson University. He recently received two distinguished awards: The Castle-Connolly National Physician of the Year Lifetime Achievement Award and The Teratology Society Distinguished Service Award. A student nominated Dr. Brent for the Castle-Connolly Award for his years of work counseling pregnant patients and families who have been exposed to environmental toxicants and were concerned about the welfare of their future child. In many cases, families had been inappropriately advised to interrupt wanted pregnancies. Dr. Brent’s advice has allowed families to reevaluate their situation, and in many cases, bring their child to term. “You can save lives in many ways,” says Dr. Brent. Dr. Brent received the Teratology Society Distinguished Service Award in recognition of his many years of dedicated service to the Teratology Society, his well-known and respected expertise in Teratology, and his exemplary research. Dr. Brent has made numerous contributions to The Teratology Society and the field of birth defects research at large. Learning to Listen/Listening to Learn: Teaching Listening Skills to Students with Visual Impairments is the first comprehensive resource in the field that addresses the importance of teaching listening skills. Out of Sight, Not Out of Mind: Personal and Professional Perspectives on Age-Related Macular Degeneration is published in partnership with The Chicago Lighthouse. The book opens with a powerful account of living successfully with age-related macular degeneration, including the emotional and psychological components of vision loss, and presents a model pioneered by The Chicago Lighthouse that integrates the individual’s psychological recovery into low vision service delivery. Hurry and book your room** at the Grand Hyatt for the 2012 Disability Policy Seminar! This event is the biggest and best opportunity for advocates to advance the grassroots movement for people with intellectual and developmental disabilities (I/DD). This year it is even more important to make your mark in Washington as we approach a pivotal election in November. This unique platform offers you the opportunity to come together with other advocates, learn about the issues, and speak with your elected officials about what is important to you. Check out the Program at a Glance and register now at www.disabilitypolicyseminar.org. Early bird registration rates are available until March 20. **The Grand Hyatt is now sold out on Wednesday night (April 25) but available the other nights of our conference. The 2012 U.S. Olympic Committee Paralympic Leadership Conference presented by Deloitte is heading back to the U.S. Olympic Training Center in Colorado Springs, CO, April 27-30. The goal of the conference is to offer program providers, including community leaders, military personnel, veteran service organizations, sport and recreation program specialists, coaches, therapists, researchers, educators, college students, and other interested parties from across the USA, the tools and the inspiration to implement, expand and support successful Paralympic sport programs. Registration will be open soon. Check http://usparalympics.org/community-programs/usoc-paralympic-leadership-conference for updates and information. First Candle is pleased to announce the 2012 International Conference on Stillbirth, SIDS and Infant Survival, in conjunction with the annual meetings of ISA & ISPID. This biennial event is expected to unite esteemed international researchers, parent leaders, stakeholders, and medical professionals to exchange vital information and concerns, and establish essential connections for the common goal of reducing infant loss. The purpose of the conference is to help prevent stillbirth and infant deaths by bringing researchers and consumers of research together to exchange information around the topics of SIDS, SUID and stillbirth. The deadline for the receipt of abstracts is 11:59 pm, March 31, 2012. Please visit www.firstcandle.org/internationalconference for more information. Every day PNPs provide prescriptions for infants, toddlers and preschoolers who are cared for in child care and early education programs. This session will provide an overview of medication administration issues in child care and early education settings, as well as recommendations for PNPs to help ensure the safety and efficacy of medication administration to their young patients in these nonparental care settings. This course has been approved for 1.0 NAPNAP Contact Hours and includes 1.0 hours of pharmacology content. Visit PNPSourCE at www.napnapce.org today!